Beginning Spring 2018, all 2-credit hour MBA core courses will be offered over 8-week terms. Please pay attention to Course Dates when registering and plan your schedule accordingly. Welcome to the University of North Alabama MBA page. UNA has one of the top MBA programs in the State of Alabama, ranking third in number of MBA graduates per year in the State. 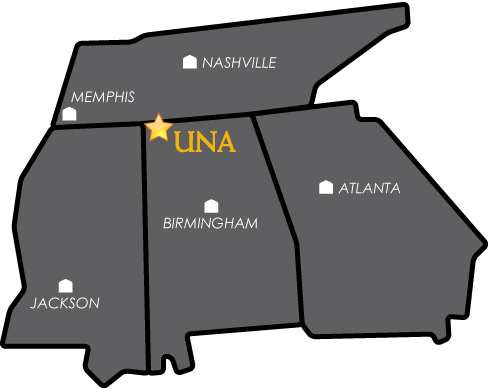 UNA's MBA program allows you an opportunity to earn your MBA for $16,150 from a Nationally ranked program. Whether you are looking for an MBA or an Executive MBA, we have all the options to fit your lifestyle. We offer an experience that is unmatched regardless of which concentration is right for you. Our professors bring real world experience to the classroom that serves as the foundation for our programs. You will benefit from their research and experience through case studies, solving real world business problems, and their dynamic delivery of practical business skills, knowledge, and strategies. Enter your information below to request MBA information. By submitting this form, I am giving the University of North Alabama consent to contact me through phone, text or email.